Whether you are looking to fit a new door for your kitchen or bathroom, a new interior door can refresh the look of your home and give a great first impression. It’s a common misconception that hanging a door yourself can be a difficult job to do, which simply isn’t the case. With our quick and easy guide, the jobs a piece of cake. Keep in mind that modern doors may not automatically fit in an older property as they would in a new build. This is simply because older door frames tend to be slightly warped. This may mean you need to adjust the dimensions of your door manually if you are buying your new door direct. We’ll come to door sizing again later. Remember to measure both the frame and the door that you are planning on replacing before making a purchase. However, if you know you’ll be resizing the door, purchase a larger door than you need. Simply measure the height and width inside of the frame. Once, you have the width and height down, you can use the biggest measurement as the main guide when buying a door. Like mentioned above, most older properties have slightly warped door frames. In order to give you a perfect finish, you may need to customize your door to allow it to fit perfectly. If the door does fit, skip to step 4. Before you get rid of your old door, use it as a guide to get the measurements of your new door. Place the old door on top of the new one and draw an outline around it. These markings will let you see what will need to be cut. Now, if there wasn’t a door there prior, or the old door didn’t fit properly in the first place, use the door frame measurements you got earlier. Before making any adjustments to the door, you will need to measure how the door will fit the frame. With one person holding the door up against the frame, place two screwdrivers under the door at both ends before running a pencil line down the door to mark the trimming line. As there should be a gap that goes around the whole door, use a 2p coin to ensure there isn’t a clash between the door frame and the door itself. 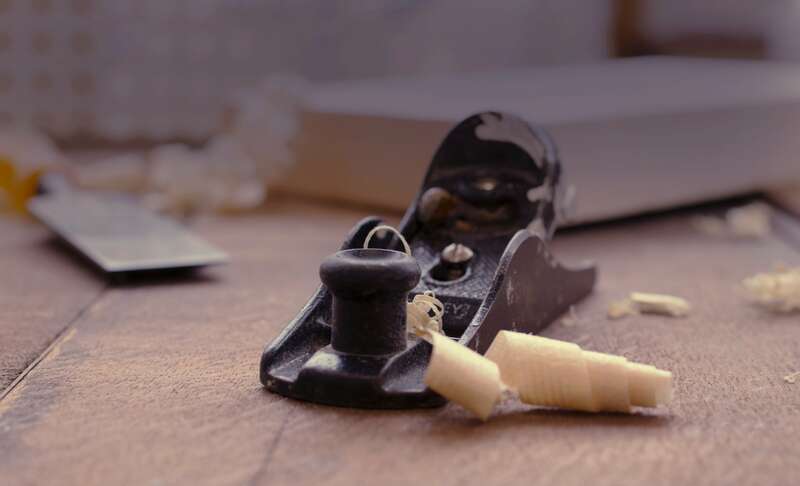 Using a wood plane, remove the access wood off the door on both ends, ensuring the door structure isn’t compromised. The way you do this is by taking off the same amount off both sides. If you need to remove the height of your new door, you cut the same amount from the top and bottom. Before you get close to your markings, check to see if the door fits into the frame better. Once you’ve achieved the size that is right, smooth out your cuttings with sandpaper. Now that your door is measured down to size, it is time to know where the hinges should go. Prop the door up in position, placing the screwdrivers underneath and 2p coins around where you want the first hinge to go. Mark out the outlines on your door where the top and bottom of an existing door hinge section on the frame are. Place the door on its side and place the hinge down between the marked lines. Draw the rest of the outline around the hinge before creating two cuts at the top and bottom of the markings with a chisel. Then, using a sharp retractable knife, make a cut around the rest of the hinge markings. Make cuts across the inside of the markings by tapping the chisel every 5mm. Next, Remove this area of wood by gently tapping the chisel blade at the front edge of the door at the same depth of hinge you are planning to use. Place the hinge you are using in the right position and make a mark in the centre of the hinge hole. The, frill a shallow hole using a drill piece that is slightly smaller than the screw diameter. Then, secure all the hinges on the door. Have someone prop the door into place again (similar to how it was propped up earlier) and line the other half of the hinge up with the existing hinge position. To ensure the door is in the correct position, only place the screw in the first hole to see if the door still opens and closes. If you are happy with the results you can secure the rest of the hinge onto the door frame. If there are issues, you may need to revisit some of these steps to ensure the door fits properly to your frame. We hope this guide helps you. If you need additional information, please feel free to get in touch with us! Or, if you’re already working on a DIY job, take a look at our tool hire service. We have the right tools for any job.